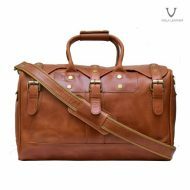 Suitable for travelling, the office, college or daily activities, Voila Rocky fits very well with your casual or daily fashion. 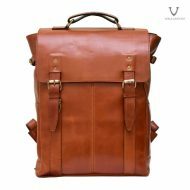 If you need or are looking for a medium original leather backpack with a simple, classic, vintage and timeless design, Voila Rocky Junior Leather Backpack is the right choice. Leather Character : Soft, tender, non-rigid, not hard and not stiff. 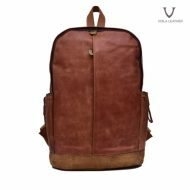 Voila leather launch Voila Rocky Leather Backpack Series using premium Crazy horse cow leather material, handmade by our experienced craftsmen, Voila Rocky is available for your medium sized leather backpack. 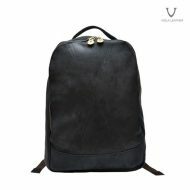 Voila Rocky Junior Backpack has a fusion design between classic, vintage and elegant wrapped in crazy horse textured cow leather – a timeless, strong and durable backpack bag. 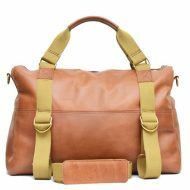 Voila Rocky Junior Leather Backpack has a simple and casual design with two zippered main chambers, and a carrying handle. Voila Rocky Junior first inner chamber comes with two medium sized pockets using soft , smooth velvet suede lining fabric, enough space to store accessories for tab, gadget, etc. 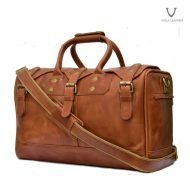 Its inner main chamber has soft yet strong velvet suede inner lining fabric, safe for storing your laptop and gadgets, completed with laptop compartment that fits a 13 inch laptop, while the main chamber itself is fit for a 14 inch laptop, a medium sized zippered pouch that is safe to keep your other accessories and equipments. 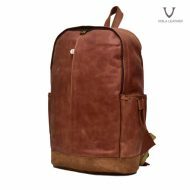 Voila Rocky Junior is launch to answer your, backpack lovers’, desire for a classic, vintage, casual designed light-weighted medium sized genuine leather backpack. 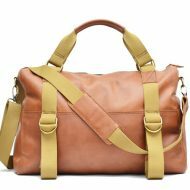 Suitable for travelling, to the office, on college campus or daily activities, Voila Rocky Junior fits very well with your casual or daily fashion. 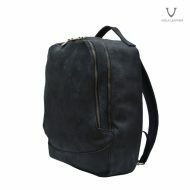 If you need or are looking for a medium sized original leather backpack with a simple, classic, vintage and timeless design, Voila Rocky Junior Black Leather Backpack is the right choice.